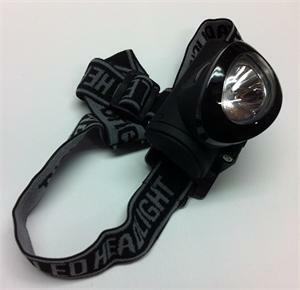 LED Headlamp : 110 Lumens. Includes batteries (3 x AAA). Has adjustable elastic headband. Has 3 modes: High Beam, Low Beam, Strobe. 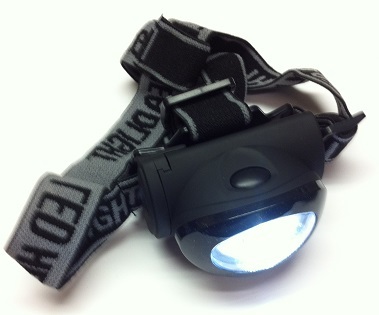 Illuminates over 150 ft. High beam lasts 5 1/2 hours. Low beam lasts over 24 hours. Has pivoting head; while wearing, the lighting angle can be adjusted over 150'. Water resistant design.